Gazing into the heart of a spiral galaxy, we sense a familiar path, a journey taken long ago, resonating from another lifetime perhaps. We are awed by the vibrant colors that the Hubble space telescope beams back. Despite the high-tech clarity of these images, a primordial urgency rises to greet us. If we stare long enough, the pinwheel of stars entrances our sensibilities until we enter a golden realm of d�j� vu, traveling back to the ultimate Source. It is the Tibetan mandala, the Navaho sand painting, and Dante's Mystic Rose all rolled into one. Our own Milky Way drifts through space like a bioluminescent starfish. Technically called a barred spiral galaxy, it is estimated to be over 100,000 light-years across and 1000 light-years thick at the outer edges. The elegant theories of modern astronomers place a mysterious black hole at the center of most galaxies, including our own. As the ultimate manifestation of the devouring Hindu goddess Kali (Sanskrit for "black"), nothing escapes this juggernaut's "event horizon," or rim-- analogous to Kali's necklace of skulls. Suns and planets, comets, galactic dust, gravity, even light-- all are subject to its voracious attraction. To the Maya this dark heart was known as Hunab K'u, the Only Giver of Movement and Measure, represented by the stepped fret or spiral. 1 Located upon the star road of the Milky Way in the direction between the zodiac constellations of Sagittarius and Scorpius, our own Great Mystery beckons. Merely one among incomprehensibly vast multitudes, the solar system where we live is poised on the inner edge of a sidereal arc, a dozen or so of which form our celestial spiral. This local arc is known as the Orion Arm. Double-spiral design on ceramic bowl. One of these gates is located near the Sipapuni at the bottom of the Grand Canyon, the portal through which the Hisatsinom 3 emerged from the past Third World to the present Fourth World. 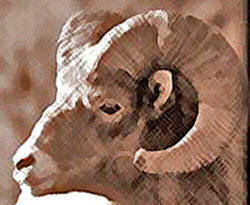 The Hopi periodically journey to this sacred area to gather ritualistic salt. Therefore, one of their names for the Grand Canyon is �ngtupqa, literally "Salt Canyon." Masau'u (also spelled Masau or Masaw) is the Hopi god of war, death, fire, the Underworld, and the earth, but he is also god of transformation. He was present when the Hisatsinom emerged upon the surface of the earth and began to make their migrations; he was there again when they finished them after many centuries. With his dibble stick and sack of seeds, Masau'u is also the humble agrarian deity who lives in balance with the earth, providing a paradigm of purity and simplicity. It is Masau'u with whom the Hopi established their divine Covenant. On a naturalistic level the spiral represents water, an indispensable element, especially for a desert existence. 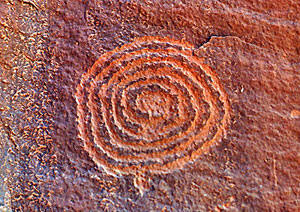 The presence of a spiral petroglyph (in Hopi known as potave'yta) can mean that a water source is or was nearby. One of the major Hopi shrines is called Potavetaka (literally, "spiral nest"), or Point Sublime on the north rim of the Grand Canyon. Here again we see the spiral motif --an icon of passage or transcendence-- associated with the canyon that the Hopi consider their Place of Emergence. In addition to water, the spiral can refer to the whirlwind or "dust devil," a sometimes malevolently destructive force in nature. On the other hand, whirlwinds frequently precede rain, so they can be viewed as propitious. 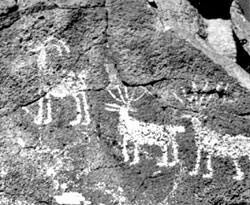 In rock art the spiral connotes migration across the surface of the earth, especially if it is adjacent to footprints carved in the stone. In this context a spiral signifies the number of rounds, or pasos 4, a clan made as it journeyed though the centuries toward its ultimate goal of the sacred Center of the World, what the Hopi call Tuuwanasavi, namely the three Hopi Mesas. While a Muslim's circumambulation of the Kaba in the holy city of Mecca may take a dozen hours, the Hisatsinom/Hopi circumambulatory migration around their axis mundi took a dozen generations, but probably many more. During this time the Ancient Ones built pueblo villages, lived there for a number of generations, then moved on when Masau'u instructed them to do so. 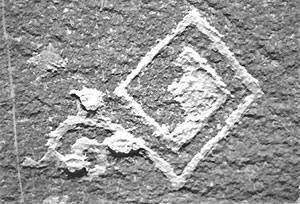 Stylized spiral petroglyph with "pueblo" symbol at the center. Near Homol'ovi Ruins State Park, Arizona. Petroglyph of lightning above spiral at Tsankawi Mesa, New Mexico. 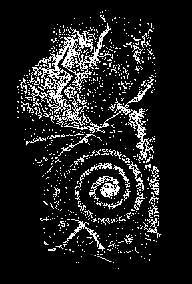 In general, the spiral found in both rock art and ceramics may simply connote motion, with a clockwise spiral denoting ascension and a counterclockwise spiral denoting descension. 5 (Was it not Jung who stated that clockwise motion represents the conscious, while anticlockwise motion signals the unconscious?) According to author Ani Bealaura, the spiral is manifested in the upper and middle worlds in a direction opposite to that of the underworld. "The right hand, deocil, or clockwise motion in Celtic belief represents the emerging, growing, material manifestation of energy. The mythological poet Robert Graves claims that the Celtic god Bran (the Greek Cronos and the Roman Saturn, whom we have identified with the Hopi Masau'u) was associated with the alder, whose buds are set in a spiral pattern. 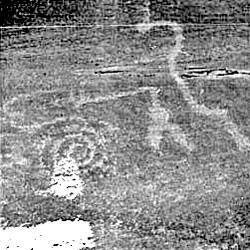 One counterclockwise spiral petroglyph located at Homol'ovi, Arizona may well represent the Pleiades constellation, due to its relative position to other images on the rock panel. In effect, it forms part of an ancient star map of stone. But like many spiral petroglyphs across the Southwest, including the famous one at Fajada Butte in Chaco Canyon 10, this spiral is first and foremost a solstice marker. At noon on the first day of summer, a small triangle of light precisely intersects the center of the spiral, verifying for agricultural and ceremonial purposes the longest day of the year. If one stumbles across a spiral petroglyph, there is a good chance that it functioned as well as a boundary marker, helping the Hisatsinom to make geodetic sense of this expansive and starkly beautiful desert landscape. triangle of light enters spiral. Spiral petroglyph at the V-Bar-V Ranch, Verde Valley, Arizona. This tight spiral is reminiscent of the coiled plaques that the Hopi weave from yucca fibers. "This is a coil basket symbolizing the road of life. It is called "Boo-da", meaning some great test which we will experience during our journey. Hopi tradition says we started our travel from the center or beginning of life, when life was perfect. But soon we began to face new obstacles. Small groups of ambitious minded men wanted to change their ways away from the original path. There were only small groups at first, but with time they increased to great numbers. Those who wanted to keep to their original ways became fewer and fewer. Those who follow these precepts may in Hopi terms be the ones "...who adhere to the laws of the Creator, who keep the spiritual path open..." In addition, the "circle of evil" is reminiscent of the transmigratory Wheel of Life. On a more psychospiritual level the spiral represents a gateway between worlds or dimensions. It is the doorway through which the shaman begins his or her ecstatic quest from the physical to the spiritual plane. (Note: The word spiral comes from the Latin spira, "coil," while the term spirit is derived from the Latin spirare, "to breathe.") In a ritualistic trance the shaman's "breath-body" searches the interstices of the spirit world for a specific cure or a personal vision to bring back to the tribe. 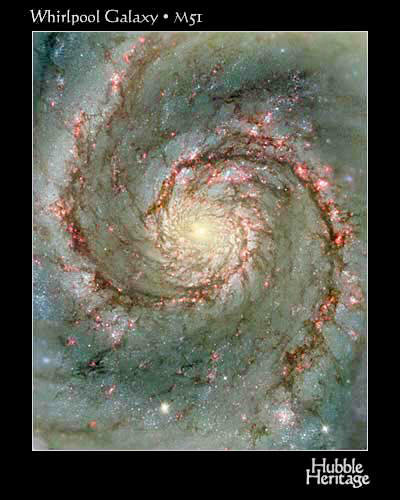 Thus, the spiral functions as a portal or gateway from the mundane to the eternal realms. The Yaqui sorcerer don Juan Matus calls these respective states the tonal and the nagual, although it is much more complex than this simple dichotomy. 12 Anyone well versed in the techniques of non-ordinary reality, however, can gain access to the latter, as we have seen in the tutelage of Carlos Castaneda. The vortices can be likened to various acupuncture points upon the etheric body of the Earth. An electric (yang) vortex --Bell Rock and Airport Mesa, for instance-- energizes and enlivens the body and the mind, creating or rejuvenating a sense of optimism or faith. On the other hand, a magnetic (yin) vortex --such as Red Rock Crossing-- calms and heals the psyche. It also encourages the flow of creative or artistic energy and may even stimulate the brain's temporal lobe to variably induce vivid memories, visions, lucid dreams, and past life or out-of-body experiences. An electromagnetic vortex --Boynton Canyon, for example-- readjusts any physical, mental, emotional, or spiritual imbalances one may be experiencing. The native peoples have used these earth spirals for millennia, and they remain a natural source of invigoration and regeneration today. These resonance patterns acted as both terrestrial havens for the gods from above and instructional centers for spiritual novitiates. Elsewhere in this article the co-authors identify these energy forms as "wise domes" (as in wisdom-- the missing "e"s belonging to the Elohim, the Sons of Light) which assisted the "magelithic" (as in magus) cultures. 16 The domes are connected by a nexus of "dome lines," or "pulsating energy channels," which are similar to ley lines. Radiating centrifugally from these sacred energy loci are spiral arms generated in harmony with the Golden Proportion. This special type of spiral is created in nature according to what is called the Golden Mean, Golden Section, or Divine Proportion, which is simply the ratio (phi) of 1 : 1.6180339... It is derived from Fibonacci's series, or a numerical list whereby each new number is the sum of the previous two numbers: 0, 1, 1, 2, 3, 5, 8, 13, 21, 34, 55, 89, 144... ad infinitum. Regardless of how large the spiral becomes, the ratio of its dimensions remains constant. For instance, the proportion AB to AC is the same as BC to BD or CD to CE. 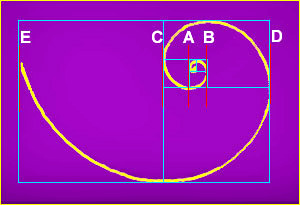 The Golden Mean can also be applied geometrically to form the Golden Rectangle, the sides of which contain the phi ratio. The dimensions of the fabled Ark (spelled with a "k") of the Covenant is known to have conformed to Golden Mean proportions. This Hebrew artifact was 45 inches in length and 27 inches in both width and height. (2.5 cubits by 1.5 cubits by 1.5 cubits, with an ancient cubit equaling 18 inches.) 17 Although the sacred object was considered sacrosanct, it has apparently disappeared, and speculation on its whereabouts continues. Besides the obvious golden/sunflower reference, the pun on "aspire," viz., "a spire," points to a synonym for the word spiral. And perhaps we would not be overly stretching the matter to note the pun on the word "pined" in reference to the evergreen, whose cones develop their seeds according to Fibonacci's ratio. In other natural forms such as the chambered nautilus and the horns of the bighorn sheep, growth occurs by addition to the open end of the spiral. The object always retains its geometric shape according to the phi ratio; thus, the morphology remains proportional. Horn size is a symbol of rank, with male horns sometimes weighing as much as 30 lb. This Golden Mean spiral starts at the Heart chakra located at Grand Falls, arcs through the San Francisco Peaks (home of the kachinas, or katsinam), sweeps by Oraibi, Shungopovi, and Walpi (the Belt), intersects Orion's right hand, circles into the Hyades horns, and passes through Gamma Tauri. On Diagram 1 above, we see the golden mean spiral as a component of the geomorphology of northern Arizona. Marked in blue on the map, "terrestrial" Orion closely mirrors his celestial counterpart, with prehistoric "cities" corresponding to every major star in the constellation. The Belt is represented by the three Hopi Mesas, where the primary habitation of the Hisatsinom's descendants is located. Near the top right of the map, the blue-white supergiant Rigel (Orion's left leg) correlates to Betatakin ruin at Navaho National Monument, while the faint yellow star Saiph (Orion's right leg) is represented by the ruins in Canyon de Chelly National Monument. The red supergiant Betelgeuse (Orion's right shoulder) corresponds to Homol’ovi Ruins State Park, whereas the blue giant Bellatrix (Orion's left shoulder) is equated with the ruins at Wupatki National Monument. Orion's upraised right arm points toward the Hohokam ruins near the contemporary city of Phoenix, while his left arm is aimed at the smaller Hisatsinom ruins located throughout the Grand Canyon. Also depicted on this map are Taurus and the Pleiades, corresponding to Grand Canyon Caverns and Grapevine Canyon respectively. 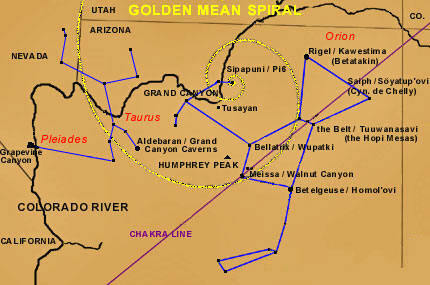 In addition, a chakra line runs from the Belt's middle star Alnilam (corresponding to Shungopovi, first Hopi village settled) through the Third Eye of Orion (Walnut Canyon National Monument) southwest across Arizona toward the mouth of the Colorado River (not shown on map). In the opposite direction (northeast) this same line traverses Mesa Verde National Park in southwestern Colorado (also not shown). 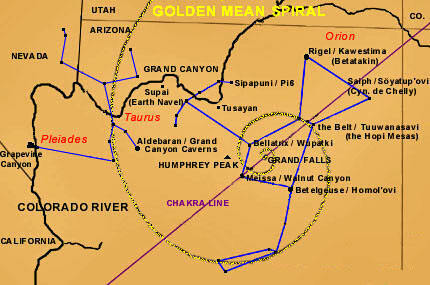 This Golden Mean spiral starts at the Sipapuni (Hopi "Place of Emergence"), arcs through Oraibi (oldest continuously inhabited community on the continent, settled c. A.D. 1100), swings through the Third Eye chakra of Orion at Walnut Canyon, then continues its sweep through the middle of the horns of Taurus. In an alternative positioning shown in Diagram 2, the center of the spiral is focused upon the Hopi Sipapuni. This schematic unifies the Grand Canyon with Mintaka/Oraibi and in turn with the San Francisco Peaks, home of the katsinas (katsinam). Furthermore, the Golden Mean spirals in both diagrams conjoin Orion with the open "V" (or "Y") of the Hyades in Taurus, whose red eye Aldebaran the Hopi associate with their celestial god Sotuknang. 21 Hence, by this mystical coil the god of earth and the Underworld (Masau'u/Orion) is linked with the god of the sky and lightning (Sotuknang/Taurus), In other words, "As Above, so Below."